Web Guru Awards: I`m with my Certificate for Guru of the Day. Photos by Rafał Leszczyński made for Web Guru. Web Guru Awards: Certificate for Guru of the Day. Web Guru Awards – the Winner – the Guru of The Day: the Art of Anna Maria Karolak. News from Web Guru Awards! 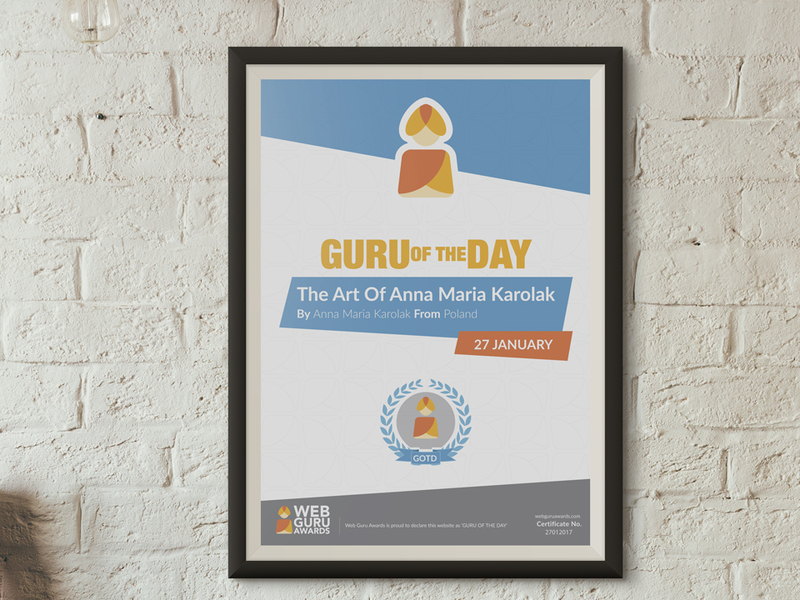 : my website www.karolak-art.com has been selected as “Guru of The Day 27 January”: http://webguruawards.com/user/details/TheArtofAnnaMariaKarolak-1107!! My website www.karolak-art.com nominated for the Web Guru Awards! Moja strona internetowa z moją sztuką – Karolak Art – została nominowany do Web Guru Awards! I`m very happy to announce that my website – www.karolak-art.com – got nominated for the Web Guru Awards!